The following is a guest article by Benjamin Bloomfield. COUPLE OF MONTHS AGO, when my brother found out that I had written a tool for applying psalm tones to arbitrary Latin texts, he suggested to me that I write a similar tool to work with the traditional Latin Mass propers, so that anyone could easily sing psalm-toned propers if (and only if*) they didn’t have sufficient time to practice the proper propers. I remember thinking at the time that it was very easy for my brother to suggest such a tool, but it would be quite a bit of work for me to actually write it. For about a month, I would occasionally think about how I might be able to get the texts for the propers for every Sunday of the year from divinumofficium.com and then look up all the proper chants based on the beginnings of the texts at gregobase.selapa.net. Eventually I did try my hand at it, and what I have come up with is at a point where it is good enough to share with the public. In its current form, you can select a Sunday (or several other feasts, of which there are still a few that I need to add; you can also select the wedding or funeral propers) and it will populate fields for Introit, Gradual, Alleluia, etc. Then you can select whether to use the full tone or a psalm tone for each proper. You can get a PDF of everything by clicking the link in the upper right. You can click on the titles (Introitus, Graduale, etc.) to go to that chant’s page at gregobase.selapa.net and see the chant next to images of it scanned from the Liber Usualis or Graduale Romanum so that you can proofread it and make sure there are no mistakes in the newly typeset version. I have already noticed and corrected several mistakes in both text and melody, so this is certainly a good idea. Also, I should make it clear that thanks are due to Andrew Hinkley for having transcribed all of these chants, and to Olivier Berten for setting up and maintaining them all at gregobase.selapa.net where they can be proofread. Without their work, I never would have been able to write this. 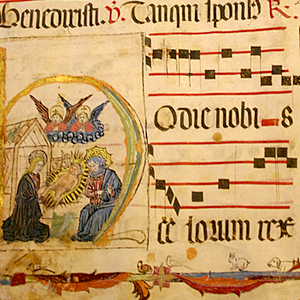 These abridged chants are intended exclusively for churches where it is not possible to properly execute all the melodies of the Roman Gradual and for which a simple melody of the Sacred Texts is tolerated (S. C. R. N° 3697). Where there are Choirs sufficiently trained, the official Chant of the Gradual must be kept.